BYU president Kevin J. Worthen addressed faculty and staff at the 2015 Annual University Conference. He optimistically spoke of the upcoming year and encouraged the congregation to continue pushing towards an eternal education. PROVO, Utah (August 24, 2015)—As slides listing student achievements rotated overhead, faculty and staff made the annual pilgrimage to the Marriott Center to attend the 2015 University Conference. 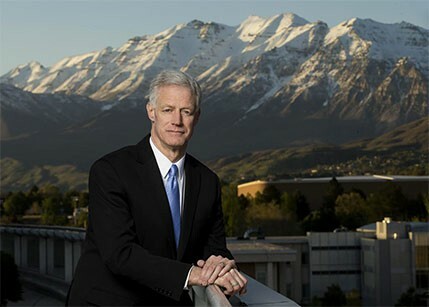 BYU president Kevin J. Worthen greeted the congregation warmly as the overhead hum of jazz music disappeared and he prepared to announce awards and give a formal address. Worthen expressed his appreciation for BYU’s gifted professors as he presented university awards. Five professors from the College of Humanities were honored for their contributions to the university. Worthen explained this statement’s significance through three insights. First, those at this university have an obligation to learn as quickly as possible. Second, learning of this sort requires both a strong mind and faith. Third, our responsibility does not end with the acquisition of knowledge; we are required to distribute the knowledge we have gained to bless others. By following these three steps, we will create an environment of “learners and lifters,” in the words of President Eyring. The relationship between learning and lifting is already being accomplished at BYU through mentored learning and research and off-campus internships, Worthen explained, citing the example of a group of engineering students who designed an inexpensive, lightweight motorized wheelchair. These types of experiences will be a high priority in the upcoming year. He concluded the session by sharing his testimony of Heavenly Father and Jesus Christ. “They have been and always will be attentive to the needs of all they who study and serve others here and who go on learning and serving others over a lifetime and beyond,” said Worthen. Kayla covers university events for the College of Humanities. She is a junior pursuing a dual degree in French studies and Journalism with a minor in international strategy and diplomacy.